If you've been dreaming of getting married on a white sand beach in front of the sparkling waters of the Gulf of Mexico or the Atlantic Ocean, the beautiful island of Key West is well worth your consideration. With its laid-back atmosphere and charming pastel houses, the island is a great destination for both your wedding and your honeymoon. 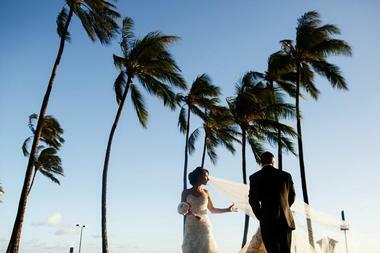 There are plenty of locations to choose from; say your vows on the southernmost beach of the United States, or while standing at the top of a historic lighthouse with stunning panoramic views of the island. 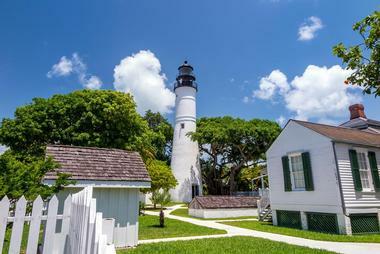 Operated by the Key West Art & Historical Society, the Key West Lighthouse has a rich history dating all the way back to 1848. Surrounded by a spacious lawn and a lush tropical garden, the lighthouse contains a number of fascinating photographs and artifacts that tell the stories of the lighthouse keepers of days past. Eighty-eight steps lead up to the top of the lighthouse, which is a great place to have your ceremony and offers a stunning panoramic view of the entire island. The venue can accommodate up to 200 guests, and there is a limited amount of parking available. 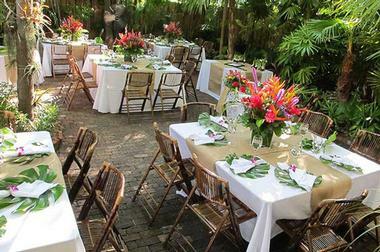 Originally built in the 1840s, Audubon House & Tropical Gardens boasts period architecture and lush gardens that will transport you and your wedding guests to the romantic Key West of the mid-19th century. 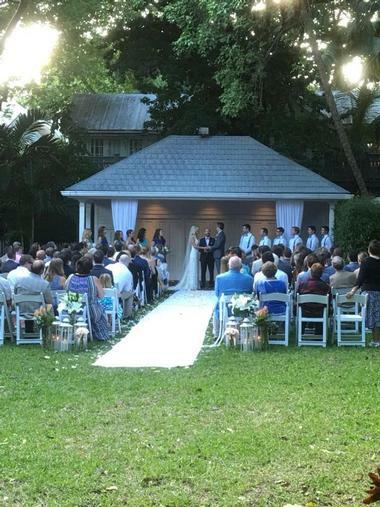 The back deck of the home is the perfect location for a ceremony with up to 100 guests, while the gardens can accommodate receptions of up to 130 people. During your event, your guests can tour the house to learn about the history of Key West and admire the artwork of John James Audubon. 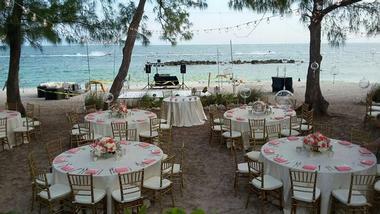 Clients are responsible for providing chairs, tables, decor, food and beverage services, and music. A landmark Waldorf Astoria resort, the Casa Marina Resort is a romantic wedding venue with the largest private beach on the island. Ceremonies can be held right by the water on the beautiful white sandy beach, and the private dock is the perfect setting for some truly stunning photos. Ceremonies can be followed by cocktails on one of the oceanfront patios, while the elegant Grand Ballroom offers high ceilings, arched windows, and hardwood floors perfect for dancing the night away. 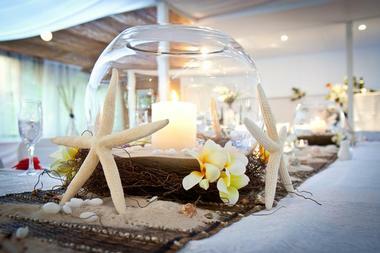 Catering and beverage services are provided by the venue, and the space can accommodate a maximum of 125 people. One of the most popular barbeque restaurants in Key West, Charlie Mac's offers mouthwatering food and a retro 1950s atmosphere. The chefs are happy to work with you to create your dream menu, and the venue is suitable for intimate affairs as well as larger gatherings. Clients can have receptions of up to 70 people in the beautiful bar, which boasts a selection of 24 craft beers on tap and is set up for live music performances. Smaller parties can be hosted in either the 40-person dining room or the 25-person Voodoo Room, which is decorated with original pieces of local artwork. One of the top-rated charter companies in Key West, Danger Charters provides a wonderfully unique way to have an intimate wedding right in the Keys. The luxurious 65' vessels are manned by coast guard-licensed captains, and they can accommodate up to 30 guests. 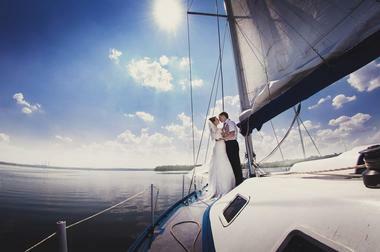 A variety of wedding packages are available, including one for couples who want to tie the knot surrounded by new friends on the company's nightly Wind & Wine sail. It's also possible to charter the entire boat; beverages and hors d'oeuvres will be provided, and floral arrangements, a wedding cake, and a photographer can be arranged for an additional fee. Located near the southern tip of the island, Fort Zachary Taylor is a 54-acre state park centered around a Civil War-era fort. The park offers five reservable wedding sites, including a white sand beach surrounded by tropical vegetation and a spot overlooking where the Atlantic Ocean and the Gulf of Mexico converge. Clients wishing to have both their ceremony and their reception in the park can rent the fortress, which includes exclusive access to the venue after sunset. In addition to the venue rental fee, clients must pay a small per-person entrance fee to the park. 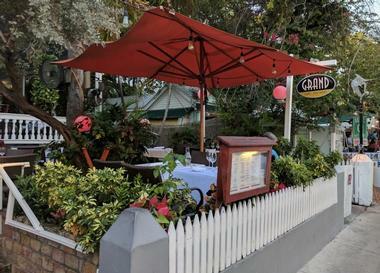 Situated in a romantic Victorian mansion, Grand Cafe Key West is a family-owned restaurant with a welcoming atmosphere. Both small and large groups can be accommodated; the restaurant offers a wraparound porch, open-air patio, and beautiful garden, all of which can be reserved for private events. Catering will be done by the restaurant staff, who take pride in preparing their food with the freshest meat, fish, and produce available. The menu features a variety of appetizers, seafood dishes, salads, and hand-cut steaks, and the kitchen is happy to create a personalized menu for your special day. Tucked away on the quieter side of the island, the Hilton Hotel Grand Key is a 216-room full-service resort that boasts lush tropical gardens and a beautiful pool with its own tiki bar. Thanks to its modern amenities and beautiful surroundings, the resort is a great location for your reception, your ceremony, and even your honeymoon. 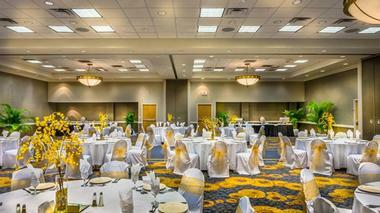 The venue can accommodate up to 200 people for a banquet-style reception, and a wide range of catering services are available. 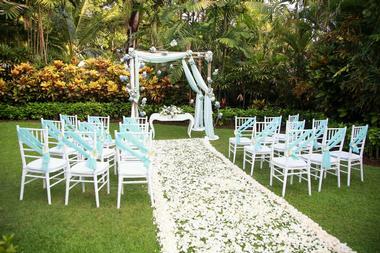 The hotel also offers a team of experienced staff members, who are happy to help plan the details of your wedding. 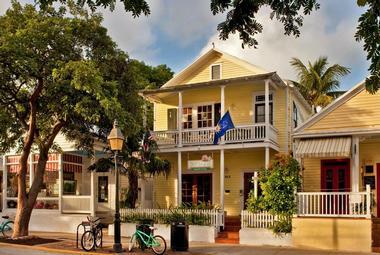 With six boutique venues in the heart of the island's old town, Historic Key West Inns can accommodate almost every sort of wedding imaginable. Several customizable wedding packages are available, including a simple package for up to 20 guests and a package that offers the chance to get married on a private sunset cruise. However, customers are also free to plan every detail from scratch. The hotel truly wants you to have the wedding of your dreams, and a dedicated event planner is available to help ensure that every aspect of your special day is unforgettable. If you want to hold your wedding reception on the water, then Key West Cocktail Cruise can make that dream come true in a truly spectacular way. The company's 47-foot boat was designed for party cruises, and it boasts two bars, a high-quality sound system, and customizable lighting. Guests can choose to bring their own DJ if they wish, but the boat is also set up to accommodate live music performances. Craft cocktails made with premium spirits, fresh juices, and hand-made mixers are available on tap, and there is also an excellent selection of wine and beer. 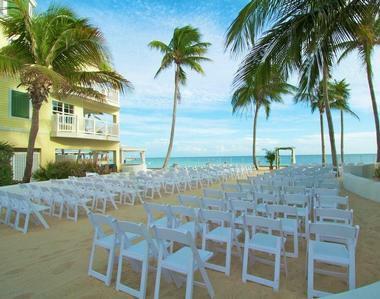 Situated on 7 acres of beautiful waterfront property, the Key West Marriott Beachside Hotel has a diverse range of options perfect for weddings of almost any size. 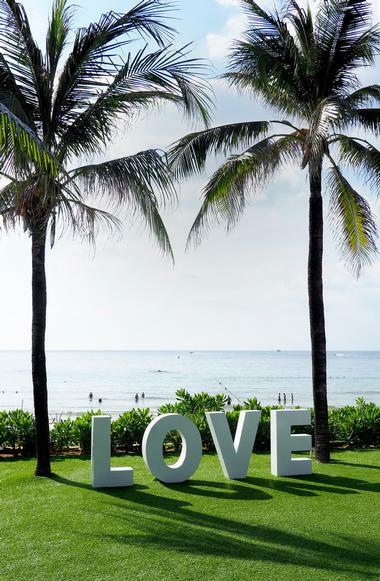 Outdoor locations include the resort's expansive private beach and a stunning tropical oasis, while indoor options range from intimate saloons to the opulent Grand Ballroom, with its high ceilings and chandeliers. Marriott-certified event planners are available, and the hotel offers wedding packages for both afternoon and sunset weddings. Some packages include a complimentary upgrade to a suite for the bride and groom, and the hotel also offers a romantic honeymoon suite overlooking the Gulf of Mexico. 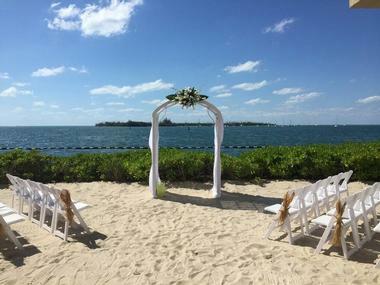 Many people come to the island to have their wedding on or near the water, and Key West Weddings on the Water offers the chance to tie the knot either on the beach or on a luxury boat. 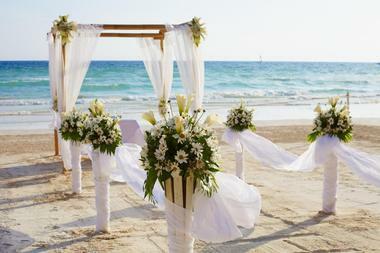 Beach venue options range from small and private to large and dramatic, and the company's 65-foot catamaran can accommodate up to 149 people for ceremonies and receptions. Plenty of wedding packages are available, including a simple sunset cruise boat package and a deluxe package that includes flowers, decor, audio equipment, and transportation from the hotel to the beach to the restaurant. A beautiful three-story Greek Revival mansion, the Old Town Manor has the honor of being surrounded by one of the oldest tropical gardens on the island. The venue's maximum seating capacity for both the ceremony and the reception is 50 people, but up to 75 guests can fit in the space for a relaxed cocktail reception. Several wedding packages are available, but the venue is also happy to work with you to create a fully customized event. The mansion has 14 rooms to accommodate your guests, and additional space is available in the hotel's two sister properties. 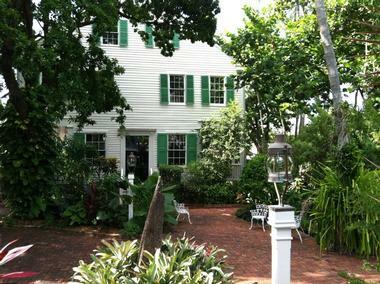 Built in 1929 for a sea captain and his family, the Oldest House & Garden Museum is truly the oldest house on the island. Today, the serene garden with its brick pathways and charming gazebo is an excellent location for ceremonies and receptions alike. Inside the home, you can marvel at the antique-furnished dining room and parlor, and the bride and her attendants can get ready in a specially-designated room. The venue can accommodate between 120 and 300 people, depending on the style of your event, and all wedding packages include chairs, tables if needed, and a security guard. Originally built as a peaceful retreat for artists and writers, the Pier House Resort and Spa embodies the laidback spirit of Key West. The resort offers plenty of indoor and outdoor venues, including glamorous ballrooms, a private beach, and a terrace that boasts panoramic views of the ocean. Wedding planners are available to help ensure that every aspect of your event goes smoothly, and the professional catering team is experienced in preparing elegant plated dinners as well as more casual fare. The resort is also home to the only full-service spa on the island, making it a great place for your honeymoon. Known as one of the top restaurants on the island, Rooftop Café is tucked away above the streets near historic Mallory Square. The kitchen specializes in New Island Cuisine, and the staff are happy to personalize every aspect of your menu. If you want to have your reception outside in the shade of a historic mahogany tree, the front street deck can seat up to 60 people. The interior dining room is available for your event as well; it has space for up to 80 people and is surrounded by sliding glass doors on three sides. A local, family-owned company, Schooner Hindu offers private charters on a carefully restored wooden schooner that was built in 1925. The boat is the perfect backdrop for everything from your ceremony to your bachelor or bachelorette party, and the captain and crew will do everything in their power to ensure your event is a success. Food and beverage service is available, and the boat can be chartered either by the hour or by the day. 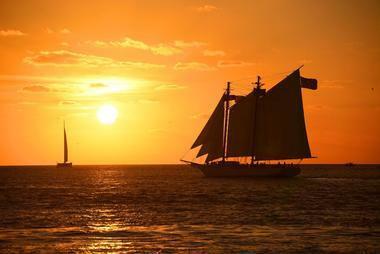 Please note that the crew spends only the winters in Key West, so the boat is available between November 1st and June 1st. 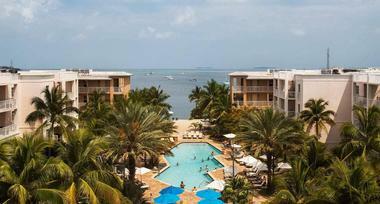 Hidden away on a secluded stretch of the island, the Southernmost Beach Resort has the honor of being home to the southernmost beach in the United States. This beautiful private beach makes a memorable wedding venue, but there are two others to choose from as well: an oceanfront bar and a tranquil terrace located next to one of the resort's three sparking pools. 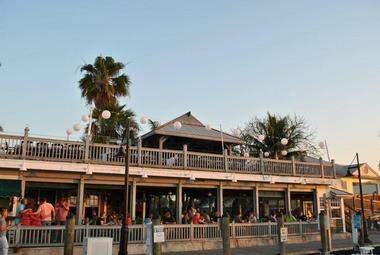 Food and beverage services are provided by the Southernmost Beach Cafe, and you can choose from an excellent selection of hors d'oeuvres, cocktails, beers, wines, plated dinners, buffet-style dishes, and decadent desserts. 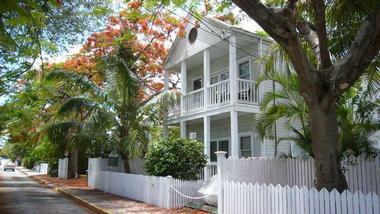 Sunset Key is a lush, 27-acre tropical island located 7 minutes away from Key West by ferry, and Sunset Key Cottages is a resort that encompasses 7 acres of this beautiful island. There is a wide range of venues to choose from, including a private white sandy beach on the tip of the island and a tropical pool garden with a red brick path for the bride to walk down. Two-, three-. and four-bedroom cottages are available for your guests, and larger wedding groups can rent the entire resort, which can accommodate up to 150 people. With its small fleet of locally owned sailboats, Sunset Sail Key West is a great choice for private boat charters that can be fully customized to meet your needs. 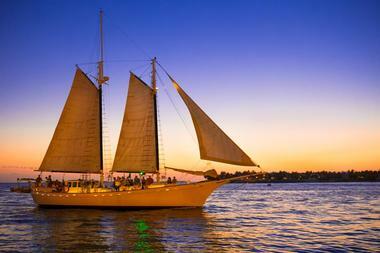 The fleet includes the historic schooner When and If, which was General Patton's personal sailboat and is perfectly suited to romantic sunset cruises. The boats depart from two locations: Stock Island Marina Village and the downtown Schooner Wharf. Trips are possible at any time of day, including sunrise, afternoon, sunset, and even during the night if you want to tie the knot under the stars or the full moon. With more than 4,700 square feet of event space, The Reach - A Waldorf Astoria Resort is a luxurious Waldorf Astoria Resort with plenty of experience in helping people execute their dream weddings. A wide range of wedding services are offered, including event management, catering, concierge services, audio-visual equipment and support, and planning services. 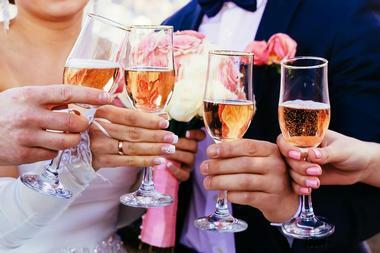 The simplest wedding package comes with white chairs, frozen towels, and flavored water, but packages including hors d'oeuvres, floral arrangements for the bride and groom, and a champagne reception are available as well. Special room rates are offered for your guests, and you can also choose to order a special day-after brunch menu. One of the oldest family-owned and operated hotels on the island, the Tropical Inn is an intimate, welcoming place to have your wedding. 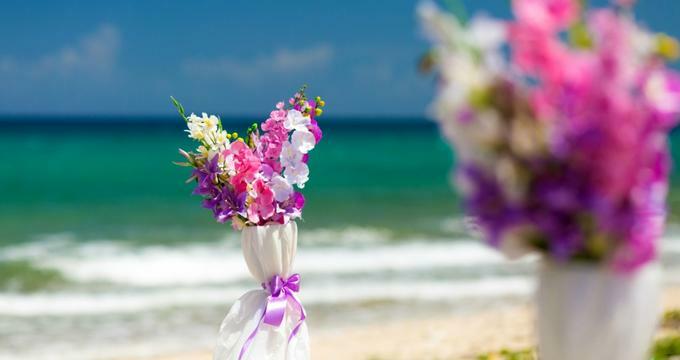 Guests are invited to have their ceremony in whichever part of the beautiful garden is their favorite, and the hotel staff are happy to put you in touch with the best wedding vendors on the island. 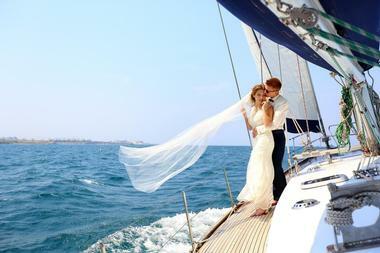 Wedding clients can also take advantage of a special honeymoon package that comes with a sunset sail and wine tasting, bicycle rentals, a dozen red roses, and a custom-engraved lock that can be put on the large bird cage in the hotel garden. The winter White House for President Harry S. Truman, the Truman Little White House is a beautiful and historic place to have your wedding. 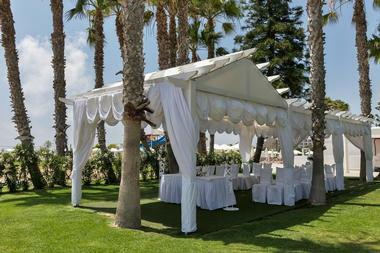 The three beautiful lawns mean that the property is one of the largest wedding venues on the island. Your wedding party will be invited to take a tour of the house, which is decorated in the style of the 1940s and contains many of President Truman's original furnishings. The venue offers wedding planners as well as all-inclusive wedding packages, and they're happy to help you find and contact the best wedding planners in Key West. Located in the heart of the Key West seaport in a former turtle cannery, Turtle Kraals Restaurant and Bar is an ideal Caribbean-inspired setting for both indoor and outdoor receptions. With more than 4,000 square feet of space, the venue can comfortably host up to 210 guests; 70 people can fit in the open-air Tower Bar, while the remaining 130 can be seated in the air-conditioned dining room. The restaurant specializes in fresh seafood dishes and other Caribbean-inspired fare, and the general manager and kitchen staff will work with you to create a customized menu.